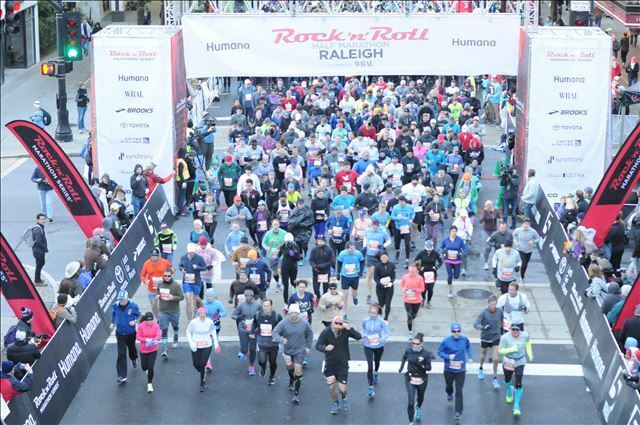 I made the decision I wouldn't formally train for this event for many reasons, but I did have a plan that would hopefully increase my fitness level enough to make it an enjoyable day. In the end, the race held some awesome memorable moments along with a few tough ones, but I could not contain my smile at the finish of half marathon #21. In March my long runs went pretty well and I felt particularly strong on the last few I did. I was pretty far off from what I hoped to accomplish. Saturday it was rainy, cold, dreary and gray. Thankfully it cleared up overnight. 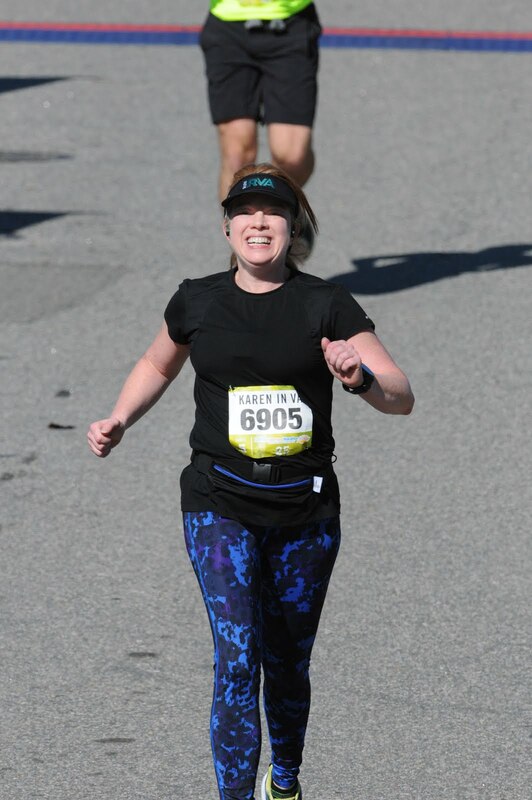 I was thrilled Sunday (race day) was a super sunny, dry chilly day! I stayed in a hotel 1.7 miles from the start line. I was thankful I found a nice young military guy to walk with since it is a bit dark in the mornings and I was not familiar with the area. We chatted the whole way and it felt like we arrived in a blink! I do wish the photographer would have caught him in this photo! I wrapped a hotel towel around my back and it actually kept the breeze from cutting straight to my skin and I was plenty warm. I got a million comments from people…”is that really helping” “you are brave for wearing a tank top” “do you know it is 30 degrees?” (I think it was 32) but honestly I felt like my wardrobe choice was perfect the whole race. It is only hard when you are waiting around in the cold and I didn't have much standing around time. Race start was 7 a.m. and my corral was off by 7:06 a.m. 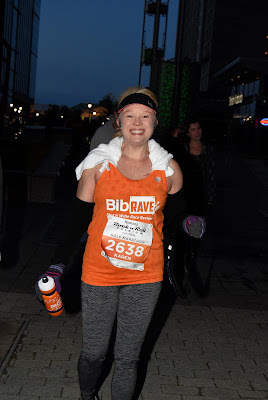 I wore homemade arm warmers and they were the greatest thing ever! You can see them better in the picture below. I used fleece lined tights and cut the feet off and they were sooooo comfy, they did not squeeze my arms at all and stayed in place, and were super warm. 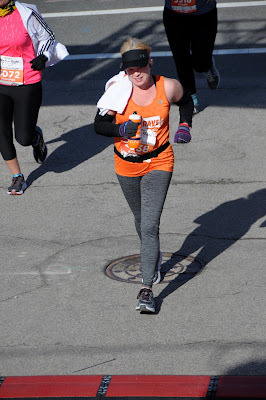 My dollar store gloves were a little lightweight and my fingertips were cold in the beginning, but after mile two I was plenty warm. The sun came out and I enjoyed the run. I never gave up my towel. By the end it was only tucked in on one side, but I figured it would be nice to return it to the hotel. I ran the first few miles and then turned on my timer (gymboss) which is always set for 4 x 1 intervals, but I skipped the walk break a handful of times early on because I felt good. I felt my energy slipping a little at the half way point. I tried to rally a few times but I just started running out of juice. The only thing I ate during the run was a delicious Girl Scout S'more cookie during mile 7. It was handed to me by an enthusiastic little troop member. I hoped that cookie would carry me to the end because my belly was rumbling with hunger by that time. I did carry my own handheld and started with a tablet of Nuun and I refilled my bottle with Gatorade twice on the course. I am soooo hydration dependent now! I can not believe the first few years I ran I never drank anything, even on longer runs. First, it was a hilly course and I have felt weak on hills since last year. I keep trying to work on my hill game, but I can not seem to make improvement. 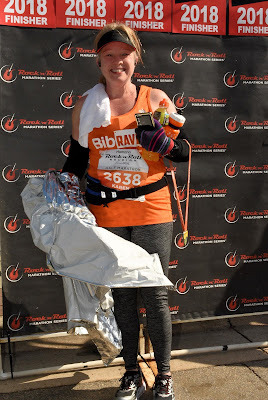 Not sure which is causing me the angst, my heart or my feet, probably a combination of both, but even in the cold weather I have struggled to find my strength running uphill. The longer the issues continue, the more I realize I just need to accept where I am at. Second, I did not sleep well the night before the race. I woke up about 2:00 a.m. and was tossing and turning, despite the big comfy hotel bed. This went on for a few hours until I finally got a good solid hour of snooze time, between 4 and 5 a.m. In the wee morning hours sleep felt more important than food, but sleeping until 5 a.m. meant I didn't have time to go and get breakfast. The hotel didn't put food out before 6 a.m.and we left to walk to the start line about that time. My breakfast was a small bag of goldfish on the way. I should have planned better, but even so, I felt really good for about 10 miles and it was a beautiful running day! The last few miles I felt a sharp cramp very low in my gut. When I tried to push the pace a little towards the end it made for an unpleasant feeling. A little GI distress is nothing new for me on longer runs and ultimately, I felt better within an hour of finishing, but it was enough to slow me down a bit. Maybe munching the cookie was a bad idea, but honestly, I've had the same tummy reaction whether I've run fasted or with a meal/meals in my system. The last .31 there was 54 feet of elevation gain (13:00 avg) LOL I was over it! This photo cracks me up! My over it shines through. and I ended up running a 2:27:58 (11:17 pace) and honestly, I am fine with that. I loved the festive feel along the course. I loved every minute of the cool air and sunshine. I love the cheering squads and music. I loved the changing scenery. I enjoyed my walk back to the hotel. I loved my sting free shower compliments of pjuractive, the best anti-chafing product ever. I loved 34,000 steps by 11:00 a.m. 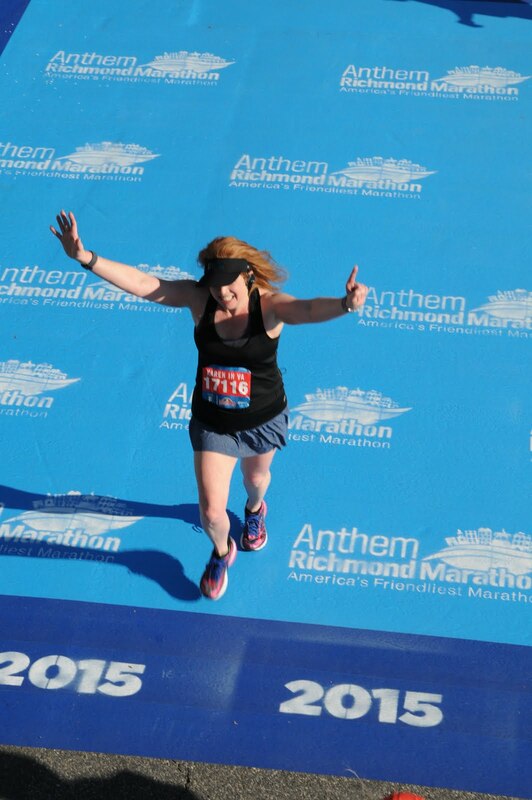 I loved that I finished 13.1 miles. I wish I would have planned for breakfast better the night before. I wish I could have slept better. But most important, I think I really came to an acceptance that races will not be anything like they were for me a few years ago. I really don't care to push my body to its limits anymore and chase a time. 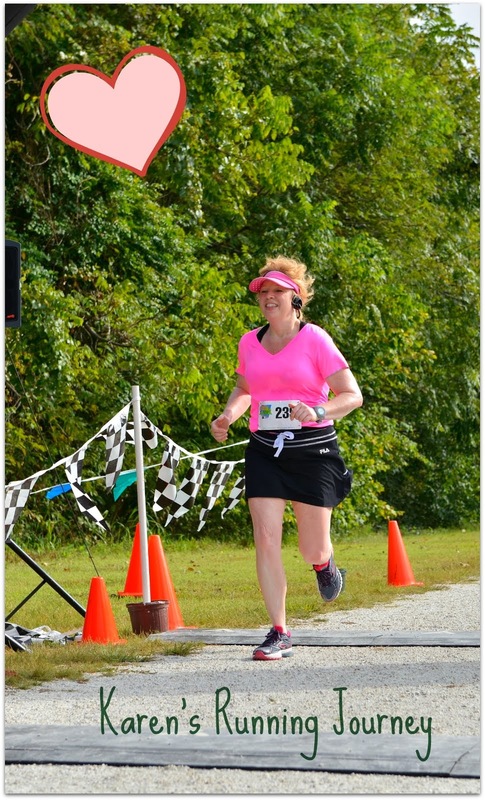 I am content to run and feel proud of crossing the finish line! 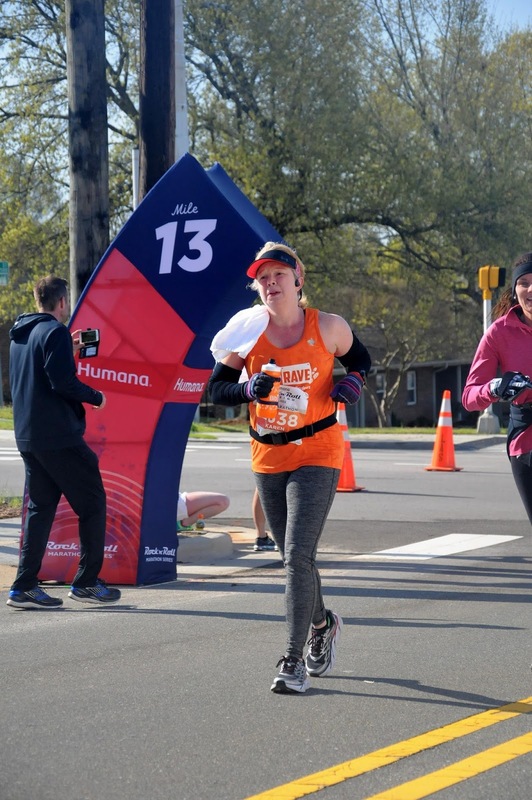 What is the first thing you want when you finish a race? Tell me about a time you walked to a start line? 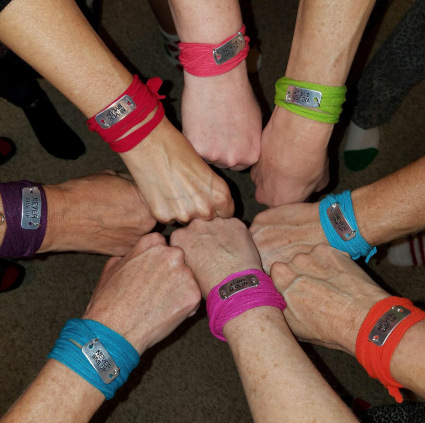 Have you made home-made arm warmers? Ever have your fingertips hurt when they are cold? Mine hurt during the first mile. 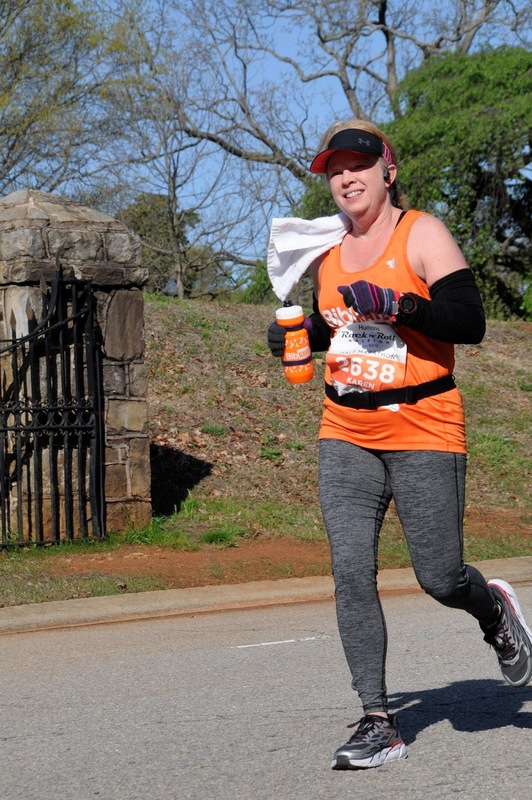 Does your GI tract get irritated from running? See your current monthly goal, streak days, and your yearly goal all in one glance. 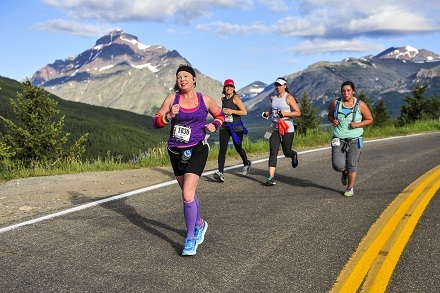 I was excited they picked my Glacier Half marathon photo for the current color picker picture. Currently all my graphs are in pretty Montana sky blue. I didn't receive a thing for this, I just think it is a cool way to check your stats!